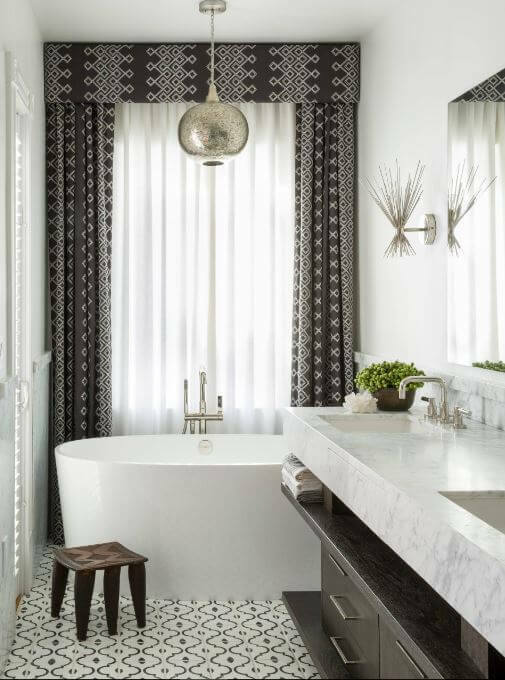 Add more thrill to your bathroom by applying these captivating bathtub backsplash ideas in them. Bathroom is one place where we start and finish our day. It is a place where we get a chance to relax and wash away life’s little stresses. And above all where inspiration strikes! Given below are some exotic bathroom backsplash ideas to make your home a visitor’s delight. Look at this classy backsplash behind the freestanding elevated bathtub. The huge window has been adorned with a maze of artistic grill. This definitely makes a chic background for the bathtub. Tile and timber combination looks great and so does the mirror recessed on the wall. The bathtub backsplash ideas such as these are simple and easy to execute. The printed curtain teamed with the white sheer curtains look awesome and creates a perfect backsplash. The tiles, though little old-fashioned where prints are concerned, looks elegant. Here is a luxurious bathroom with a large square bath on a raised platform to give it grandeur. 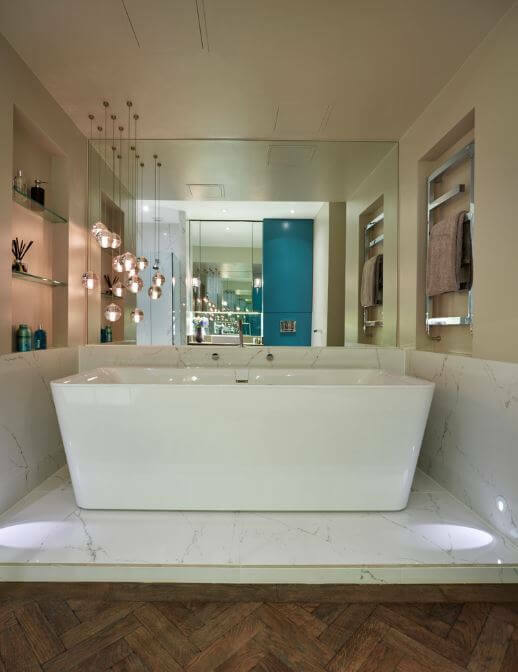 The mirrored backsplash behind the tub is instrumental in magnifying the open space area. Also the glass pendant lights are taking good care of the illumination. The recessed towel rail also draws my attention. This is a wonderful bathroom; you can see glamour and glitterati all over it. These incredible bathroom backsplash ideas speak of royalty and extravagance. Use of gold metallic tiles as backsplash is a novel idea and you should actually try incorporating it. This is a large spacious bathroom. The designer has made it a point to play with LED lights. 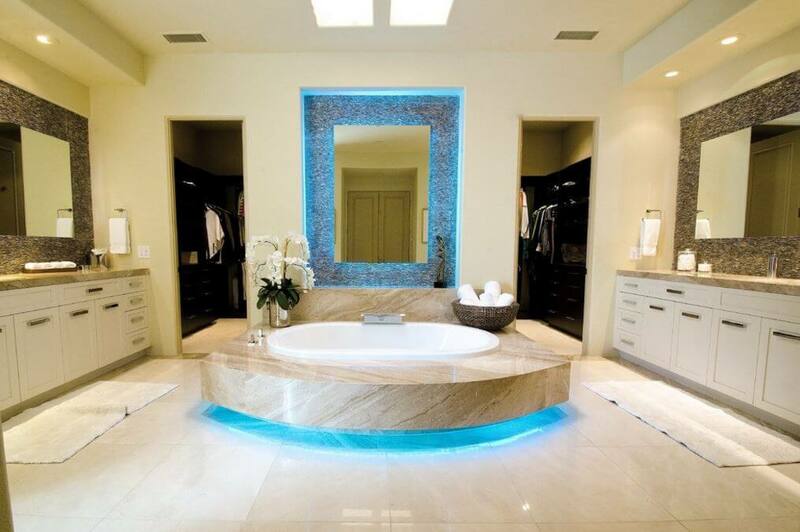 The bathtub backsplash is highlighted by blue LED light. It creates a frame around the mirror making the area quite conspicuous. LED light below the bathtub are also creating a magical effect. 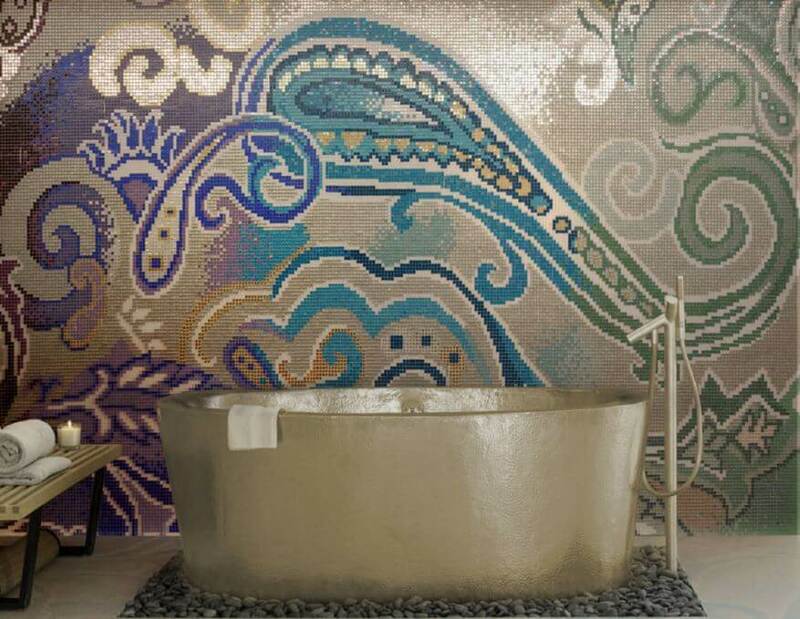 Check out this contemporary glass mosaic paisley backsplash wall pattern. I love the color of the tub and the way it sits on those pebbles. 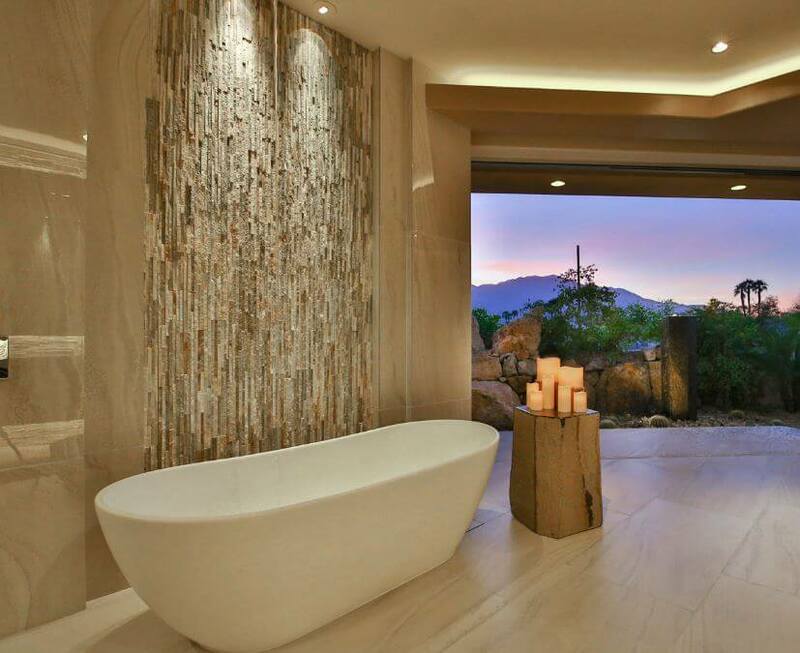 This gorgeous bathroom is sure to leave you mesmerized and enchanted by its beauty. This round bathtub looks interesting and so does the accent wall behind. The lily mural on a huge mosaic tile is quite a jaw dropping creation. 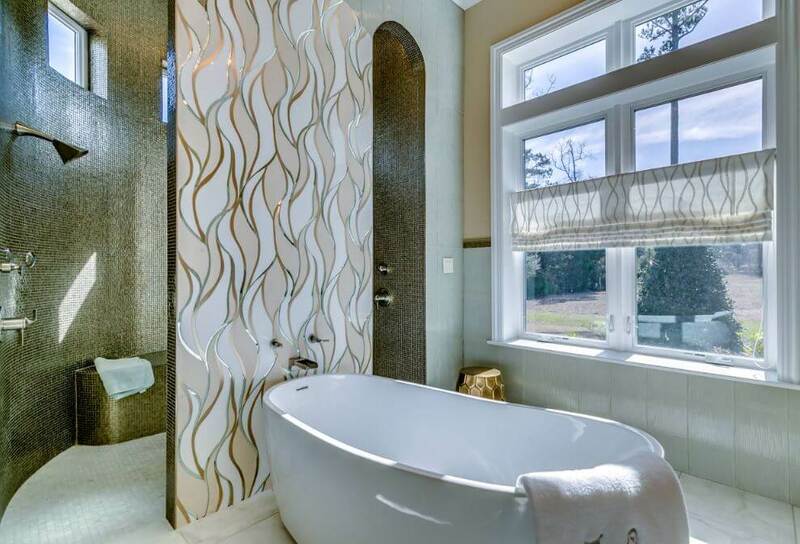 I like the tile work surrounding the tub and yes, it does have a nice fireplace to keep you warm during winters. This bathroom seems to share space with the master bedroom. It has a bathtub, sauna and a shower. I love the shape of the tub and the tin tiled wall backsplash behind it. At this point, I cannot miss out the magnificent crystal chandelier, it looks fabulous. This is a narrow bathroom and the space has been divided wonderfully for various functions. The wallpaper behind the tub has got an attractive pattern on it. It goes well along with the window treatment. 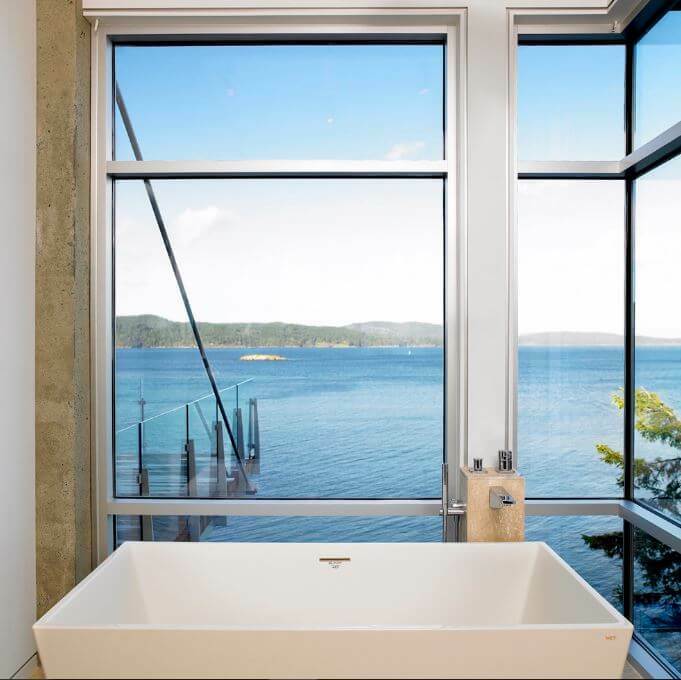 The huge window allows sufficient sunlight into the bathroom giving it a fresh feel. 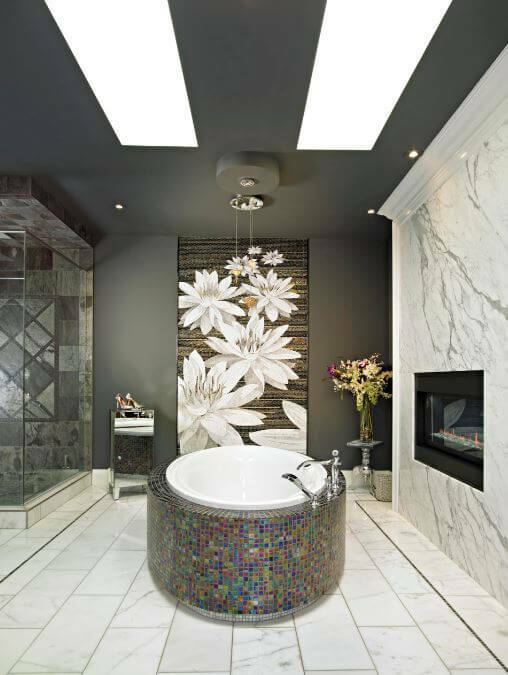 This is a smart-looking master bathroom with a fabulous tub and a stylish wall mounted faucet. The wooden plank behind the bathtub area portrays a perfect blend of tiles and wood. Adding more to it is this amazing light fixture, looks like a bundles of bubbles put together to glow. 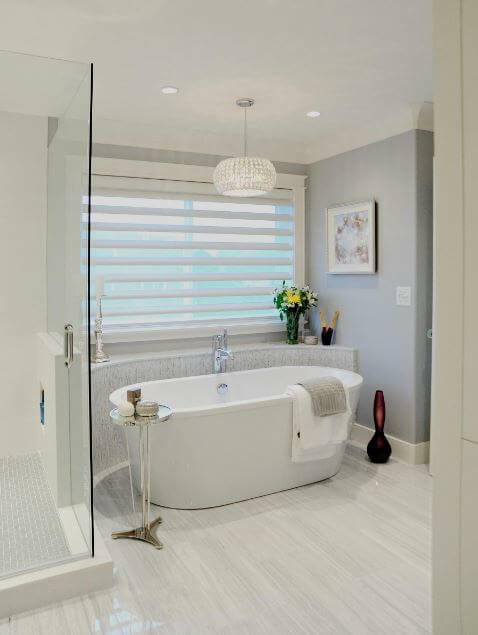 Here is a serene bathroom with beautiful grey tiled floor and free-standing bathtub. The curved ledge behind the tub with a smart window treatment serves as a fabulous backsplash. It’s an ideal place to relax after a long day. The light fixtures and the other accessories have been put artistically, thus showcasing the aesthetic bent of the owner’s mind. These bath tub backsplash ideas are amazing and outstanding. The huge window overlooking the beautiful garden will always be able to extend its fresh feel into the ambience. This unique bathroom set up has got a faint glimpse of the ‘Flintstone Age’. The textured accent wall behind the bath tub is amazing and has been highlighted well. I love the vast open area, the view is really breathtaking! A trip to the world of fantasy! This ambience is enough to make you feel on seventh heaven. Sheer curtains have been beautifully attached around the bathtub. They also fulfill the need of a bathtub backsplash. The Victorian chandelier is an added plume to the cap! Most of these bathtub backsplash ideas are practical and extremely functional. 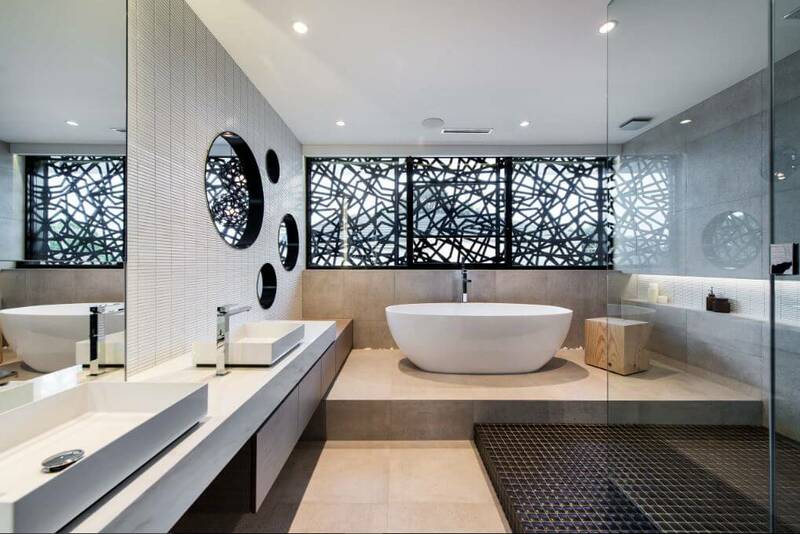 This is a super sleek yet tactile bathroom. The shape and size of the bath tub is excellent. The lake view makes the ambience serene and peaceful and looks ready to take you amidst nature. This entry was posted in Bathroom, Bathroom Designs and tagged Bathroom Backsplash Ideas, Bathroom Bathtub Ideas, Bathroom Design Ideas, Bathroom Designs, Bathroom Ideas, Bathroom with Bathtub and Shower, Bathtub Backsplash, Bathtub Backsplash Designs, Bathtub Backsplash Ideas, Bathtub Backsplash Tiles, Bathtub Design Ideas Pictures, Bathtub Designs, Bathtub Designs and Backsplash Ideas, Bathtub Designs and Sizes, Bathtub Designs for Small Bathrooms, Bathtub Designs with Tiles, Lavish Bathroom Designs, Luxury Bathroom Designs, Small Bathroom Tub Ideas by Preeti Sinha. Bookmark the permalink.